So it has been a few weeks since we arrived back in Guildford after our epic adventure. Perhaps unsurprisingly as more time passes since we finished, the more we enjoyed the ride, the bigger the hills were and the faster we rode them. Unfortunately Strava doesn’t lie! We have even got back out on our bikes and started riding them for fun again. Time also provides a chance to reflect on what we got right, what we learnt and what we would improve upon. When planning the ride one of our biggest concerns was nutrition. Could we eat and digest enough calories everyday to sustain us. We been advised by Louise the nutritionist at Surrey University’s Human Performance Institute to eat as much ‘real food’ as we could to avoid any stomach issues. But we calculated that with an average day of over 180km with 2800m of climbing we would need to consume an excess of 4000 to 5000 calories every day, for a month! The most important meal of the day, breakfast, was often a challenge as we aimed to be on the road by 7:30am each day, and that was often earlier than many of our hotels usually served breakfast. However most of them went out of their way to be helpful and started service early so that we could pile in granola, fruit, yogurt and an abnormal quantity of eggs! A chance and serendipitous meeting with the guys at Veloforte a couple of months before the ride led to their support and they definitely fuelled us all the way. On a typical day we aimed to eat a Veloforte bar between each break: typically 60km to coffee, 60km to lunch and 60km to the end. Fortunately, the bars aren’t just fuel, but taste amazing too so eating them never became a hardship. We even found ourselves snacking on them on our rest days! The fact that they are made from natural pressed produce also helped with digestion which was a major pre-ride concern. The original three flavours are great, but we particularly liked the new Pronto bar with caffeine for an early boost and the Forza with protein to help recovery at the end of the day. 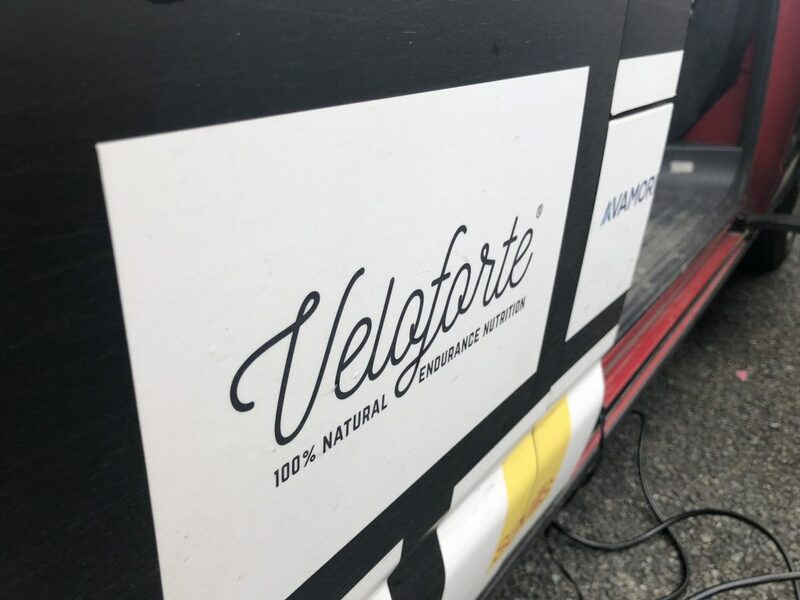 The three new varieties of bars were launched during the ride so the lovely people at Veloforte organised a special delivery directly to our hotel in remotest North Wales! We supplemented the bars with some tasty TORQ gels when needed for that extra boost and also used their energy powders, and had recovery shakes at the end of each gruelling day. On the first few days of The Challenge, we stopped for lunch in cafés and pubs. However, we soon realised that this would significantly lengthen each day. You could easily spend more than an hour ordering, waiting for the food and eating it, and getting back on the bike after sitting down for all that time was not much fun either. Instead we found that Jim’s catering service, another of our support guru’s many skills, was a much better idea, and lunch became a supermarket sandwich and snacks by the side of the road with Jim’s trusty workbench, camping stove and kettle. We had lunch everywhere from a bus shelter to a fire station! Evening dinner was typically eaten in the nearest place to the accommodation and food was often chosen by asking the puzzled waiter/waitress which dish was the largest or had the highest calorie content! As well as being familiar with the hills around the UK, we are now connoisseurs of Sticky Toffee Pudding across Great Britain, the best being in the George Hotel, Inveraray (one of the many reason to go back there).